There have been a few leather and wood craft projects going around, but this is one of the first that combines the two into a contemporary DIY pendant light fixture. Step by step instructions available at the link below. Concrete table lamps, concrete stools, and now concrete pendant lights: I am clearly obsessed with new uses for this inexpensive material! Make It: Modern Metallic DIY Pendant Light -- From Empty Toilet Paper Rolls! Yes, you read that right. This oh-so-classy and minimal light is made from a decidedly not classy material: used up toilet paper rolls. Currently, all our pendant lighting needs are being met, but the next time I need something awesome (and inexpensive) to light our place, I will definitely try out this DIY origami lamp! We've been seeing brass, gold, and copper making a big splash in home decor for the last few years, but these metallic pieces usually carry a hefty price tag, especially in the lighting department (um, have you seen the prices of Lindsay Adelman chandeliers??). It's always exciting, then, to see people get creative with inexpensive materials and come up with something super stylish and on-trend, like this brass and copper pipe light! Just when I was getting a little antsy with the ombre trend*, THIS project comes along. Dang you, awesome lighting projects! You get me every time. Inspired by one of my favorite lights (the Frame Pendant by Iacoli & McAllister if you're curious), this DIY version is equally colorful and a fraction of the cost. Also? The perfect project for a rainy and cold autumn afternoon! Got a cardboard box? Awesome! Turn that sucker into a pendant light! In celebration of Modernism month at Curbly, we rounded up 20 of the best and coolest modern lighting projects on these here Interwebs. Yes, you read that right, TWENTY. So, put on your DIY pants, it's time to get illuminated! How To: Make a DIY Wood Cube Pendant Light! This might be one of the coolest lighting projects I've seen in a while! It's big, bold, modern, and kinda rustic all at once... win-win-win-win in my book! Make It: A DIY Hanging Light Bulb Chandelier! Part rustic, part industrial, part awesome! With a few basic hardware store supplies, this DIY chandelier is a cinch to make. Remember the plastic spoon rose? Turns out that is just the tip of the iceberg as far as spoon-crafting is concerned. Take for example these (dare I say?) gorgeous spoon pendent lights. How To: Make Your Own Wire Orb Light! The Random Light by Moooi has inspired many a DIY variation (including this cool hemp version), but this is the first time I've seen the aesthetic translated into wire--and I love it! It's a perfect statement piece for just about any style interior from contemporary to farmhouse, eclectic to modern. Of course, the best part is you can make it yourself! DIY Idea: Make a Colorful Two-Toned Lamp Shade! If you're looking for an affordable way to spruce up your decor or add a playful pop of color, you're in luck! We've just found the perfect DIY solution for you. Read on! Make It: A Colorful DIY Ruffle Pendant Light - For Cheap! Colors, glorious colors, oh how I love you! I especially love when you show up in unexpected places and blow my mind with your brilliance. 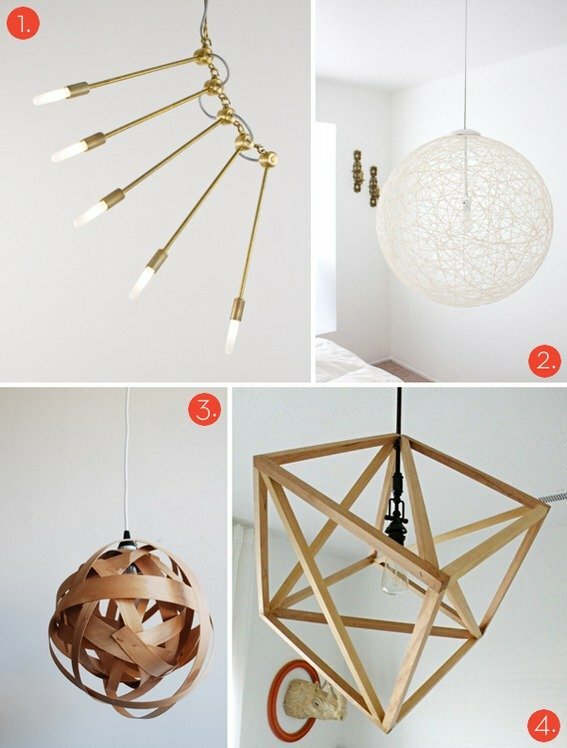 Because seriously, what you're doing for this DIY pendant light is OUT. OF. CONTROL. How To: Make a Scandinavian-Inspired "Rag Light"
We love a good DIY lighting project here at Curbly and this Scandinavian-inspired number is beautifully unique and incredibly easy. Want to see how it's done? Read on! Sherry of Young House Love had an inspired idea for making a fast, cheap and easy pendant lamp for her office. Looks good, right? Would you believe it consists of nothing more than an oversized shade and the original ceiling light fixture underneath?